I bet I feel even better than the picture could ever show. I have lost right about 120lbs from pre-surgery diet until today! The hospital was completely amazing. Star-Medica is a place that US hospitals should strive to match in both appearance and professionalism. The place is gorgeous and you feel very comfortable the minute you walk in the doors. It is furnished well and it is sparkling clean..
Dr. Rodriguez and his associates, including the anesthesiologist, are super friendly and took lots of time to calm my nerves and answer all of my questions. I had never had surgery before so I was a nervous wreck. Dr. Rodriguez checked on my twice the night of surgery and then daily after. 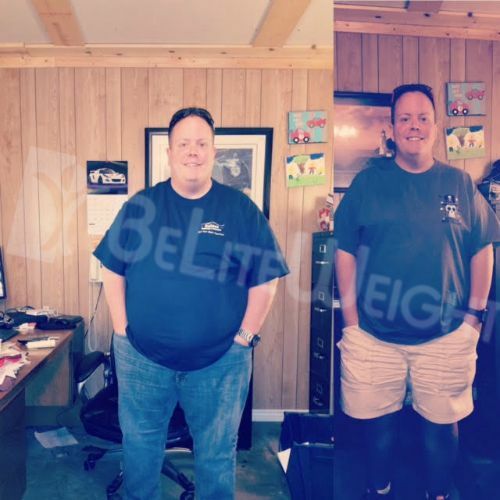 I also saw one of his associate surgeons daily in addition to his nutritionist who came daily to talk to me about lifestyle changes moving forward. They were all amazing. I have already sent two of my close friends for surgery and a third recently paid her deposit. The length of stay was perfect in my opinion. I'm a busy body and any more time down would have been hard. I was off pain medicine at noon the day after my surgery, so I spent a lot of time walking the halls and watching television. I was ready to go home and was pain free when I left.. I did not spend one penny more than I was originally quoted. I was actually impressed. I was honestly afraid of there being a shake down when I got there for more money. That was not the case at all. The admissions team at the hospital was ready for my arrival and processed all of my paperwork quickly and I paid my balance with a cashiers check. . Not only did I feel safe in Juarez, I have considered traveling back to El Paso to visit again. I feel like it would be a neat city to take some time to explore. I think the only surprise that I have encountered is how quickly I have lost weight and how good I felt immediately. I can eat nearly anything I want now, but small small doses. I watch what I eat and I take my supplements and honestly I feel great. I don't suffer from insomnia anymore nor do I feel exhausted all day long. I was a size 52" waist and now I'm in a 38. That's the biggest surprise. I would not only do it again, but I wouldn't wait until I was 37 to do it. I realize how much of my life I have missed and quite frankly, it's sad. I am a huge supporter of the surgery and know that it's a blessing. If you're ready for the long term changes, I think you'll do well. The hardest part of the entire journey was learning that food isn't fun or delicious, it's merely something that I need a couple of times a day for survival. There are times that I see someone eating something that I want, and I want to tackle them and steal it, but it passes quickly. You'll find things that will help you forget about food. My secret is my Yeti tumbler. It keeps ice cold water with me all day. If I feel the need to munch, I drink some cold water and it fills me up really quickly and I move on.